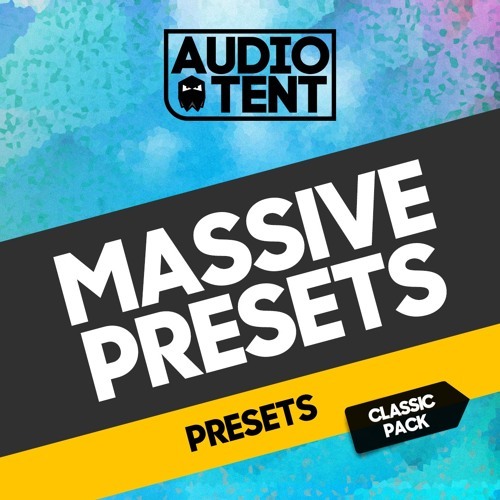 Audiotent are extremely proud to present you with the very latest collection of 64 sounds for Native Instruments Massive.﻿ We have left no stone unturned with every preset, meticulously designed from scratch and using all eight macros in every patch.﻿ Pushing the Massive to its limits, Audiotent has you covered in every area of production - from throbbing basses, searing leads and huge progressive plucks to evolving aps, lush pads and keys, full-on chords, sparse percussion and spacial effects.﻿ Just fire up the patches and unleash your next EDM anthem! Presets included in the pack: 15 x Bass 10 x Lead 5 x Arp 10 x Pluck 5 x Pad 5 x Chord 5 x Key 5 x Perc 5 x FX Please note: The audio demo uses drum samples and simple white noise transitions that are NOT included in the pack. ﻿ This pack contains Massive presets only. 64 Massive Presets. Espectacular esos cambios de intensidad repentina. es muy hipnotizante. Big Up! cool beat, and pretty dynamic too! song goes so hard right about here and warps vibes a few times digging that! this gets super heavy right here nweeda get this on my ski play list! The synth work is spot on and really has a huge feel to it. Everything is mixed well and too and flows well from star to finish. The beat has a good groove to it as well. These sound awesome man! I'd love to try this out! Love these sounds from the massive vst. You made some really good presets! Great for house music! love these sounds man! so many layers, so effective! pro sound designs man! Beeg! nice track bro feeling the mix. had a nice up tempo. the beat really hit hard. good work. lots of nice sounds I would use. perfect for any one looking to get into progressive and or electro house. this intro is sick! i like how many transitions there are! very good and spot on for the rave scene! massive reverb and panning left and right love the dirty house sound real tight mix too of some of my favs. i like how you got down to business right away. awesome catchy lead. sick drop as well. these soudns are great. Right on guys these are pretty cool patches you came up with. Really reminds me of a lot of the top beatport 1000 tunes kinda flavor going on here.